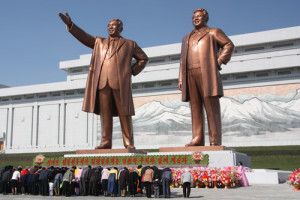 North Koreans bow to statues of former leaders Kim Il-sung and Kim Jong-il in the capital of Pyongyang. Photo: J.A. de Roo via Wikimedia Commons. Leftists all over the world are silent about the hangings of gay men in Iran. They do not protest the stoning of women who have been raped in Somalia. They do not protest the starvation, murder, and torture of hundreds of thousands of North Koreans. The only country that is the target of the BDS Movement is Israel. Leftists have lost certain aspects of their belief in Marxist theory, but they remain ferociously anti-Israel. Their hostility against the freest state in the Middle East helps us to partly understand why North Korea, 5000 miles from Israel, is building both nuclear weapons and missiles. North Korea will do what it can to help Iran in its attempt to wipe Israel off the map.